A Little bit of Lorene: I love suprises! Hi everyone! My daughter Trina called me. she is our CA girl. a good friend of hers was moving. She had 2 treadle machines, did she want them? oh yeah. So Trina called me. She said one was made in the late 1800's and the other one was made in 1949. Both Singers. She wanted to keep the older one. did I want the newer one? hmmmmm, YES!!! Now to get it to AZ. My daughter Jenn - one of our AZ girls - had to make a quick trip over to CA. She was going to be by Trina. She brought it back for me. Thank you Sweetie! I understand that it is a series 15 - 88. I think it was made in Scotland. There are a few things that need to be done to it. the belt needs to be tightened. I need a bobbin case and bobbins. I have plenty of needles. The plate is loose on the front of the head. And it needs to be cleaned. It is a treasure for sure. thank you Trina for sharing. Thank you Jenn for picking it up and bring it home. and thanks to my sweetie for not complaining about another machine! You are a very lucky mom to have such thoughtful daughters. Fabulous treadle machine. 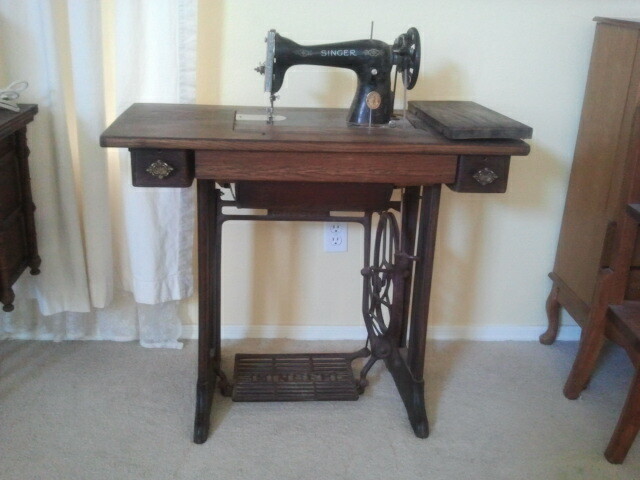 Congratulations on your wonderful treadle. I have a 15-88 from 1936, same cabinet, made in New Jersey. I piece and quilt on mine. Caution: Do NOT use water for cleaning. I'd be glad to share more helps if you e-mail me. WOW what a great surprise!! Such nice daughters and hubby! Did you see the picture done for me by a member while I was on my mission in Bolivia, done on a treadle machine. Check my blog. A shopping we did go! Another Table Runner Swap is finished!